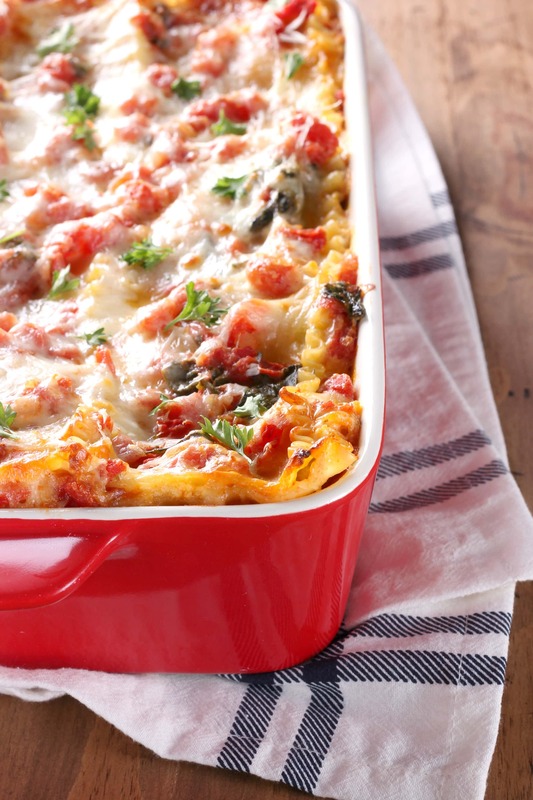 Warm and hearty, this simple Cheesy Spinach Lasagna recipe is perfect comfort food for any time of year! Back in January, I reviewed one of America’s Test Kitchen’s newest cookbooks, What Good Cooks Know, and I mentioned then that I couldn’t decide between a couple of recipes to try. At the time I went with the bakery style lemon poppy seed muffins. Well, this lasagna was the other recipe that I was really interested in trying. 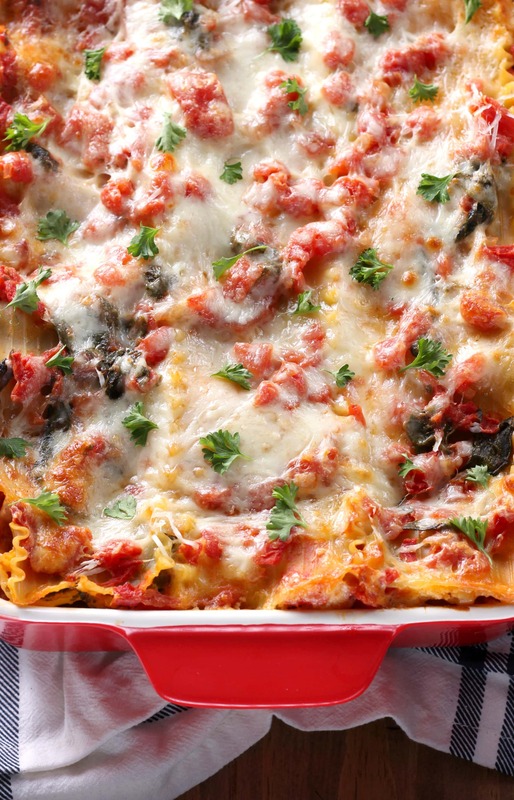 There’s just something about a steaming dish of lasagna that is the quintessential comfort food! 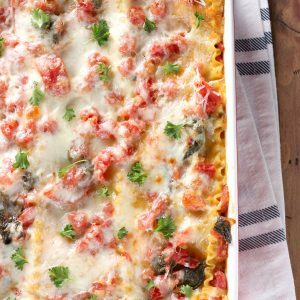 So, if there’s an opportunity to try a new lasagna, we’re not going to pass it up! That, and I was intrigued by the simple homemade tomato sauce that it used. As much as we would like to, we all don’t always have the time to chop a bunch of tomatoes and make our own pasta sauce completely from scratch! This recipe starts with canned tomatoes and adds in onion, garlic, oregano, and a bit of red pepper flakes. I thought it needed a little more and added in fresh parsley, spinach, and more red pepper flakes to amp up the flavor. I really liked having the bits of tomato to bite into instead of having a completely smooth sauce. Between that and the spinach, the flavor was a lot fresher than a typical lasagna using jarred pasta sauce. I also used more cheese. Because, around here, we don’t skimp on cheese! I also really wanted to be able to taste the Parmesan on the top layer of cheese. That slight nutty flavor gives more flavor than just a plain mozzarella layer. The end result was a hearty, comforting pasta dish that tastes like you spent more time on it than you actually did! Combine olive oil, onion, and salt in a large saucepan over medium heat. Cook until onion is softened, about 5 minutes. Add garlic, oregano, black pepper, and red pepper flakes. Cook for an additional minute. Stir in tomatoes and bring to a simmer. Simmer until sauce thickens, about 15-20 minutes. Stir in spinach and parsley, cover, and remove from heat. In a medium bowl, mix together ricotta cheese, 1 cup Parmesan cheese, basil, egg, salt, and pepper until combined. Spread 1/3 cup of spinach tomato sauce in the bottom of a 9x13 inch baking dish. (Dish will be very full, so do not use a smaller baking dish) Lay 3 noodles over the top. (Break pieces of noodle to fill in the crack at the end of each noodle, if desired) Spread 3 tablespoons of the ricotta mixture over each noodle. Sprinkle 1 cup of mozzarella cheese over the top. Spread 1½ cups spinach tomato sauce over the cheese. Top spinach tomato sauce with 3 noodles (filling in cracks, if desired). Spread 3 tablespoons of ricotta mixture over each noodle. Sprinkle 1 cup of mozzarella cheese over the top Spread 1½ cups of spinach tomato sauce over the cheese. Top tomato sauce with 3 noodles (filling in cracks, if desired). Spread 3 tablespoons of ricotta mixture over each noodle. Sprinkle 1 cup of mozzarella cheese over the top Spread 1½ cups of spinach tomato sauce over the cheese. Top with remaining 3 noodles (filling in cracks, if desired). Spread remaining spinach tomato sauce over the top. Sprinkle with remaining mozzarella and parmesan cheeses. Cover baking dish with aluminum foil that has been lightly sprayed with non-stick cooking spray. Bake for 15 minutes. Remove foil and bake for an additional 25-30 minutes, or until cheese is browned and filling is bubbling. Remove to a wire rack and allow to cool for at least 10 minutes before serving. This recipe is adapted from What Good Cooks Know. Lasagna is the ultimate comfort dish! This cheesy spinach version looks delicious! I so agree! Lasagna is such awesome comfort food! This looks fantastic!! Girl, this looks divine! I absolutely love cheese lasagna and now I’m craving it like nobody’s business. I’ll have to make this recipe happen soon. Have a great weekend! Lasagna is just one of those foods that’s always a hit, and I don’t believe in skimping on the cheese either. This looks perfectly cheesy and delicious! Cheesy and delish! 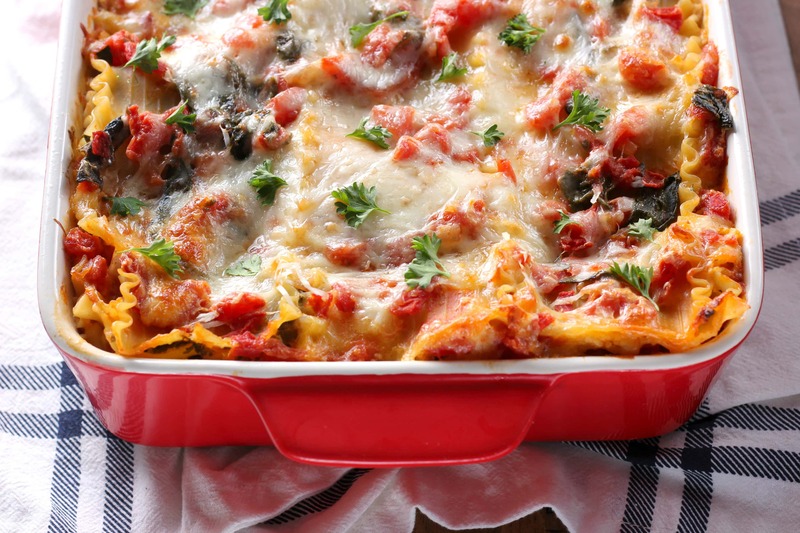 Love a fresher lasagna- gotta try this. Those red pepper flakes must give it a little zip too. I’m all for the cheese overload. Bring. It. ON!!!!! Cheesy lasagna is one of my all-time favorite dishes. Your version looks so bright and tasty! This would be a hit at our house, too!!! Love the double dose of cheese and the spinach—it sounds perfect! 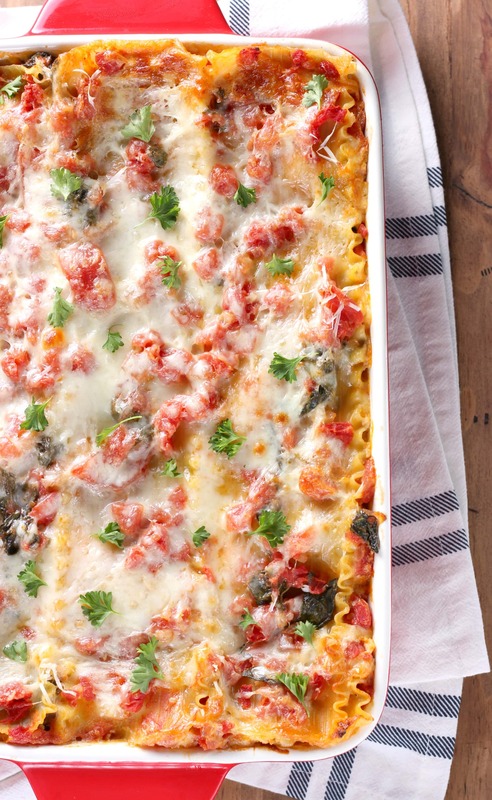 It looks so delicious I have to make this lasagna!